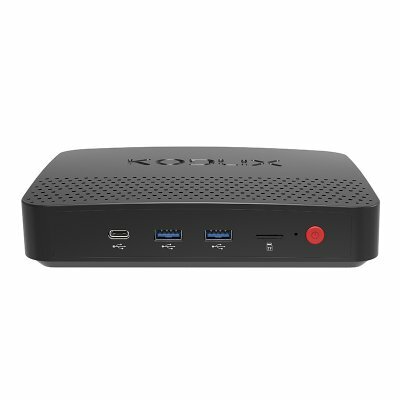 Successfully Added KODLIX N42 Mini PC - Windows 10 Pro, 4GB RAM, N4200 Apollo Lake CPU, SATA, Dual Band Wi-Fi to your Shopping Cart. Dual Band Wi-FI brings quick connectivity and saves the hassles with wires. Expandable memory up to 8GB brings a commanding performance. With its Intel Apollo Lake N4200 CPU, 4GB of RAM and Windows 10 Pro OS the N42 mini PC from KODLIX brings a refined computing experience in a compact package. Suitable for home, office or the classroom the N42 mini PC is fanless and but its good design and power efficient setup prevent any overheating worries. There are 2 SODIMM slots so you can expand the RAM with another 4GB DDR3L and have 8GB RAM that's sufficient for even the most demanding programs or games. You can also supplement the 32GB of onboard memory by adding your own SATA HDD to the setup as there is a vacant slot to hold a 2.5-inch disc internally. Alternatively, connect a network drive or USB pen drive to none of the many ports as there are 2 USB2 and 2USB 3 as well as a Type C port. With dual-band Wi-Fi, you'll be able to enjoy fast wireless connectivity and removes one extra cable from the setup process. You can connect with HDMI to any screen and the HDMI port allows for 4K resolutions. There is also a VGA port for connectivity with older monitors and screens should the need arise. A licensed version of Windows 10 Pro (64 Bit) comes preinstalled as the operating system of choice and this will offer a sleek interface that is intuitive to use and supports all the productivity software any office or classroom would need, you will also find it suitable for a range of games so this powerful Mini PC has loads of usability in just about any scenario. The KODLIX N42 Mini PC comes with 12 months warranty, brought to you by the leader in electronic devices as well as wholesale cool gadgets and computers..